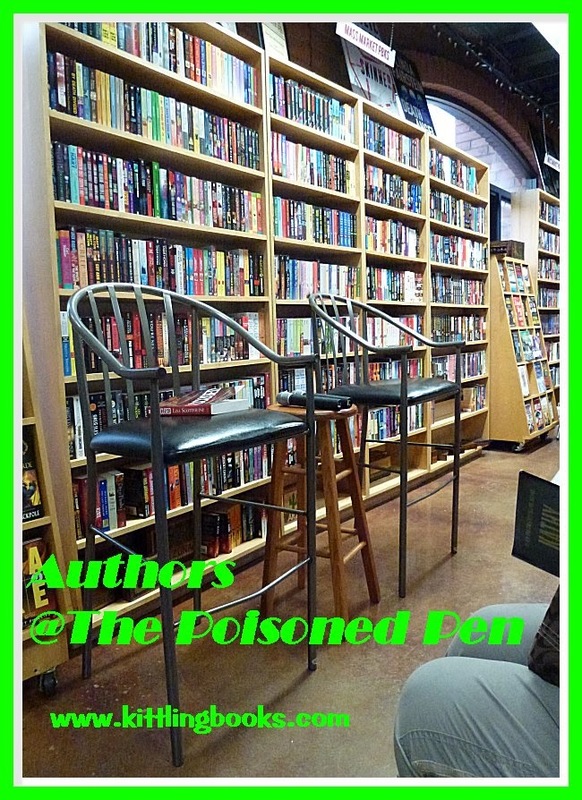 @ The Poisoned Pen with Michael Robertson! The night before, Denis and I went to our favorite bookstore, The Poisoned Pen, to see an author, and here we were, back the very next night. When we walked in the door, David saw us, grinned, and said, "It's either feast or famine with you two!" This is often true. Once in a blue moon, the authors scheduled to appear are ones that I don't read, so I don't make an effort to go. However, if it wasn't such a schlep across town, I'd probably be there for almost every single one. Hello. My name is Cathy, and I'm addicted to crime fiction. Tonight we were here to see Michael Robertson, author of the excellent Baker Street Letters series. Have a yen for more Sherlock? Haven't read Michael Robertson? As one of the stipulations of the lease for their 221B Baker Street law offices, brothers Reggie and Nigel Heath are responsible for answering letters addressed to Sherlock Holmes. Can they help it if they occasionally find themselves doing more than ticking boxes and sending out form letters? It's a wonderful premise for a series, and I certainly recommend them to you! 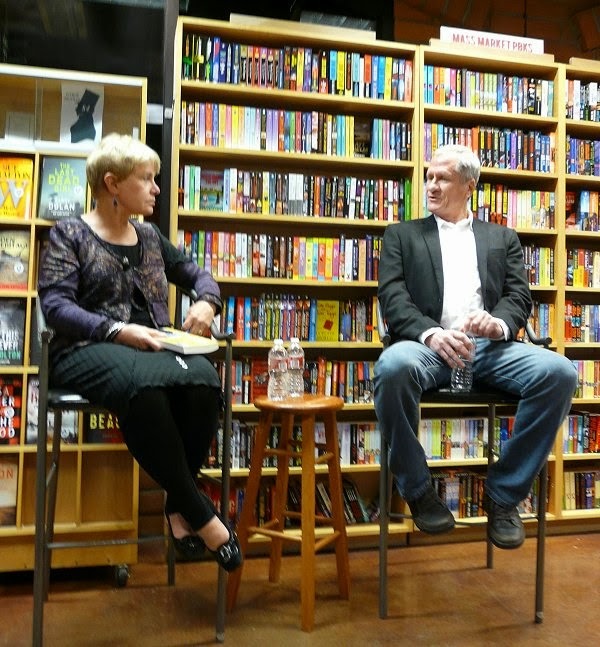 "You're always hearing bad news about independent booksellers," Barbara said. "They can't get loans from the bank, they're closing.... I just wanted you to know that we didn't have to take out any loans for the improvements we've been making to the store. They've been paid for-- in cash-- and that's all due to you." The other piece of news Barbara shared with us wasn't as welcome to me. Since there are two huge mystery conferences being held in California this year-- Left Coast Crime in Monterrey and Bouchercon in Long Beach-- Barbara made the decision not to hold either the CozyCon or The Poisoned Pen Conference this year. I won't be able to go to either one, so I'll miss the two events hosted by The Poisoned Pen, but I understand Barbara's reasons for making that decision. 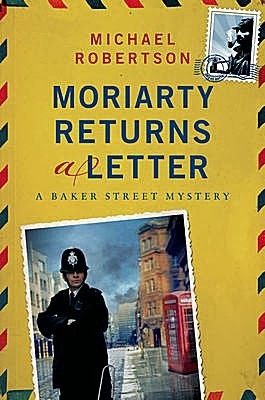 With that news out of the way, Barbara and Michael immediately began talking about his latest book, the fourth in the Baker Street Letters series, Moriarty Returns a Letter and other little tidbits about the books. "I had some Holmes scholars mad at me when I attended the Bouchercon in Albany," Robertson said. "Organizations like the Baker Street Irregulars believe that Sherlock Holmes and Dr. Watson are real. When I told a full house that my books were based on the premise that Holmes and Watson are characters in fiction and are not real, I was almost booed out of the room." Many years ago, Robertson read a magazine article about actual letters that had been written to Sherlock Holmes, and that article gave him an idea. He checked. His idea had not been done, so he wrote a screenplay. In 1980 he quit his job and went to Hollywood to pitch his work. He had thirteen story ideas, which he believed would be enough for someone to commit to a television series. One man asked him, "What about the second season? What about season number three? You don't have a TV series, you have a book series." His dreams of a Hollywood liefstyle in tatters, Robertson went back to work in the real world. It was only when his career had begun to taper off that he felt he had time to devote to writing a book. He resurrected that old screenplay and made the necessary changes. It took ten years for him to write that first book, and he wrote it as though he were Sir Arthur Conan-Doyle. The manuscript did not work in any way whatsoever. That first draft and a few others were thrown out before Robertson settled on a style that's more "Dashiell Hammett and The Thin Man." Then Michael and Barbara made certain that we all knew the difference between a solicitor and a barrister. Here in the USA, all lawyers are called...well...lawyers, but it's an entirely different kettle of fish in the UK. Solicitors are the type of lawyer that you and I would normally consult about wills and property and the like, but barristers are the ones who wear robes and wigs and appear in court before a judge. When asked if he'd done research in UK law for his books, Robertson told us that he had. He'd even attended a trial at the Old Bailey that involved a law suit against George Lucas over the design of the Stormtroopers' costumes in the Star Wars movies. He noticed that the barristers and the judge loved to make jokes, but that the usher in charge of keeping order in the court was a very serious person indeed. Robertson's newest book goes back to 1893. "I hope I've done something so the Baker Street Irregulars either really like me or really hate me in their tongue-in-cheek way," he quipped. He does have to be careful, though, not to misuse items from the Holmes canon so there won't be any complaints from Conan-Doyle scholars. "You used a very interesting approach to Moriarty's identity and why he and Sherlock Holmes are enemies. All I'll say is family legacies are involved," Barbara said. When asked about the timelines, Robertson said, "I'm always careful with those. I write everything out on a chart, such as the timing of an airline flight that occurs in the book I'm writing now." This work-in-progress involves romantic entanglements, which means taking a little detour. Nigel will find himself boarding a plane in London that will take him to Los Angeles. Robertson is always very careful to say that his books are not a pastiche; Reggie and Nigel are not Holmes and Watson, they are dealing with the fall-out created by the fictional characters. Another thing that he's careful about is checking his facts. He will often go back to his previous books to ensure that he's kept everything straight. "What do you think of the TV series Elementary?" asked a fan. "I love it," Robertson replied. Warner Brothers bought the option to Robertson's first book, The Baker Street Letters, and have since renewed that option twice. The studio pitched the idea of a series based on the books to CBS, but CBS decided to go with Elementary. Robertson thinks Holmes and Watson are here to stay. Basil Rathbone portrayed the famous detective in a series of movies in the 1930s and 1940s. In the 1960s, Mr. Spock was Star Trek's version of Sherlock Holmes. In the 1970s, there was Nicholas Meyer's The Seven-Per-Cent Solution. The 1980s had Jeremy Brett as Holmes in a television series, and the detective's longevity continues to this day. "Conan-Doyle's genius was Watson," Barbara Peters said with a smile. "The reader feels inferior to Sherlock Holmes, but superior to Watson. It is a very successful formula." 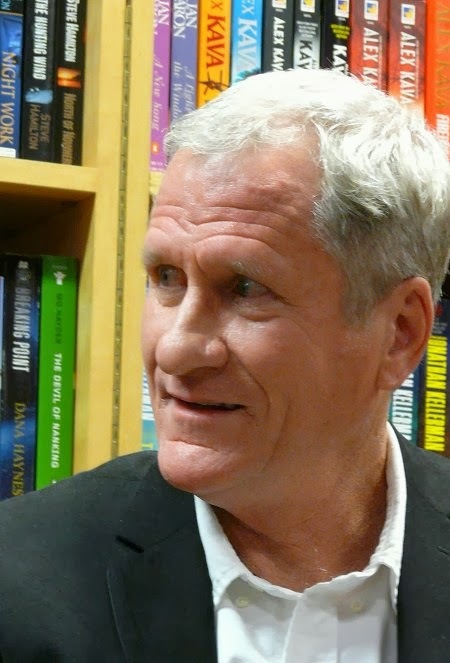 Michael Robertson wound up the evening with some insight into his writing. In 1936 Abbey House was built on the two hundred block of Baker Street and did begin receiving letters addressed to Sherlock Holmes. In later years they published a selection of these letters, and Robertson has studied them very carefully. "As a writer I want to make the plot and the characters work, but I go back to see if I like what I read," he confided. He's also learned that he comes up with a lot of his ideas while listening to soundtracks while he's walking or driving. Music is a must. How successful was the evening? Before we left, Denis had purchased a copy of the first book in the series, and I was reminded that I need to read my own copies sitting on the to-be-read shelves! Cathy - That certainly does sound successful! I just love your tales of what happens at PP! And I ought to check those books out. You should, Margot. They're a lot of fun! I'll have to look into these. What with two versions of Sherlock Holmes on TV, and the Laurie King series with Mary Russell and Sherlock Holmes, I've kind of got an interest in related things. So do I, and what's odd is that-- although I've read the stories-- I've never much cared for Conan-Doyle's Sherlock Holmes! Too Victorian, perhaps? I don't know that I care all that much for the originals, either.